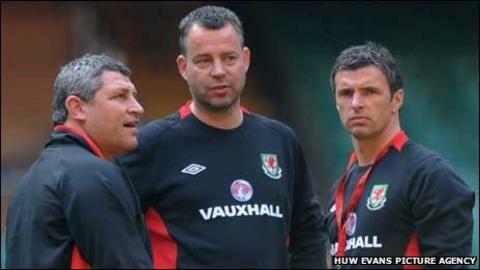 Osian Roberts says he and fellow Wales assistant Raymond Verheijen could be out of a job when the Welsh FA appoints Gary Speed's managerial successor. Roberts and Dutchman Verheijen have had "informal" talks with the Football Association of Wales as they consider who to appoint after Speed's death. Roberts is "confident" the FAW "will want to keep as much intact as possible" to continue Speed's "legacy". But Roberts knows he could be jobless if the FAW names an outside candidate. "And rightly so," said the Welshman. "Every manager would want to make sure he has his his own set-up in and everybody understands that and possibly that is what might happen." Wales will play a Gary Speed memorial international against Costa Rica, the team Speed made his Welsh debut against in 1990, at the Cardiff City Stadium on 29 February, their first game since Speed's death on 27 November. The Welsh FA has confirmed the process on how Wales' 13th full-time manager will be appointed as the FAW has charged a six-man managerial panel, led by president Phil Pritchard, to appoint Speed's replacement. Wales hope to unveil Speed's successor before their Costa Rica friendly but chief executive Jonathan Ford admitted "it is too early at this moment to tell" if Wales will have a manager in time for 29 February as it still "early days" in their search. Roberts, though, feels the FAW should secure a prompt appointment because . "We all know it is a short timescale as we only have February, May and August before the first qualifier in September," said Roberts. "So that's three opportunities to get the squad together, so radical changes are going to be difficult I would suggest." Clayton Blackmore admits former Wales captain Ryan Giggs would be "ideal" to replace Speed and the former Wales international defender feels Giggs could "juggle" playing for Manchester United in the Premier League and managing Wales. Verheijen, who has helped coach Netherlands, Russia and South Korea at World Cups, has stated his ambition to continue as part as a Wales management team alongside Speed's other right-hand man Roberts. Wales star Gareth Bale insists "most of the players" want the FAW to retain Verheijen and Roberts, as the Tottenham Hotspur winger feels it would be "absolutely ridiculous" to make significant managerial changes. And Roberts admits: "You could have a situation where a manager comes in and says let's continue in the the same vein as things are going well. He might want to keep as much consistency as possible. "Or he might come in and say I might want to change it and do it my way, which is understandable. "We've had informal discussions [with the FAW] but they have to look at what potential managers are out there. "And what do they look for? What profile? Do you bring in a experienced manager? Or a young manager? "But I'm confident that they will want to keep as much of what has taken place over the last 12 months intact as possible." Wales won four of their last five matches under Speed and Ford admits: "We need to work out exactly what was going right. "And everybody the players, the fans and the management team want to ensure we carry on that legacy that he was establishing. "Of course, there has got to be somebody that we finally appoint but that time will come."